Many writers today are first or second-generation immigrants who live and work in another language, one of Canada’s two official languages. Although their mother tongue may still occupy a part of their lives, this part has been relegated to a circumscribed private territory which does not enter easily into relation with either living or writing in the acquired dominant language. For a writer, the problems and paradoxes this poses come constantly to the fore and are so complex that any attempt to use the mother tongue as a vehicle for writing is quickly abandoned. To understand the scope of the problem in the life of an individual writer, it is informative to consider what happens to a language upon immigration. Most North American immigration up to 1960 was of peasant stock due to an industrialization which progressively developed a modern economy by erasing indigenous feudal cultures and enlarging the middle classes. Writers who are children of this wave of immigration and who would work in their mother tongue find themselves writing within a sensibility that is pregnant with feeling and presence, yet speechless. Peasant speech occupies a place in a cultural hierarchy: its task is to describe the cultivation of soil and the taming of animals. To do this requires physical presence and sound. Being oral, its standards are upheld by cyclical rituals that involve the earth and the speaking self rather than the thinking self and a body of written law. As language, it is not amenable to forms of communication which occur in a society whose allegiance is to a stable corpus of standardized signs rather than to the signs of the earth in seasonal change. The sensibility of language that develops within a scripted tradition is missing. Between the acquired language and the mother tongue, how can there be common ground? The two languages have long since staked out their territory within the psyche and the balance that has been achieved is seamless and invisible. For writers who would explore that boundary, there is no recourse but to approach both languages in their oral states as reservoirs. But soon the mother tongue would hold the writer in an earth it can no longer cultivate, and the acquired language would become more abstract to accommodate that ‘unreal’ experience. The relations between reservoirs soon become saturated and static: experience in one is felt as a threat by the other. The mother tongue, judged by the requirements of the activity of writing, turns in to a barren, moon-like landscape explored by forms proper to the acquired language. The result is inaccessible both to the acquired language and to the original language that evolved in the homeland. Yet, if I were to look at the phenomenon which touches me intimately solely from a social perspective, as if my languages were objects to manipulate in view of a written goal, I would be forgetting that at some point in time I gave myself to language and that I have entrusted language with my life. I would be calling my experience in language a body separate from myself and I would be saying that the object has grown alien. If I were to stop at this, not only would I end up abandoning Furlan, my mother tongue, I would also be stating that the sounds I made in Friûl until I was six stayed there when I left, that Furlan belongs to a place outside of me. But those first six years of my life can’t be separated from me. They spread through my time like my child body spreads through my adult body. And how many of those six years that run through me are unspoken or abandoned because I can’t find their forms in English? Furlan, my mother tongue, is a marriage between Celtic and vulgar Latin and is a member of the eighth Romance language group, Ladino. It is spoken in a small province of northern Italy and its dialects vary from town to town due to millennia of invasions and very localized life. Although it is a language, it developed a standardized script only recently. But most of what I have learned about myself and language through writing did not develop because of a rediscovery of Furlan. The balance that Furlan and English struck within me long ago is so very entrenched it feels saturated and inaccessible. At a certain point, my two acquired languages, Italian and English, were forced to come to terms with each other within me. It was this experience that led me to consider ways of approaching the more remote Furlan. When my family emigrated to Canada, my parents decided that Furlan was such a minority language that it would not be of use to their children in the future. Therefore, in our house, our parents spoke Furlan between themselves and they spoke what Italian they knew with the children. It took only a few years for me to reply to both languages exclusively in English. In my teens, I could understand both Italian and Furlan, but I spoke them badly. I suspected that my English had become insufficient so I went back to university in Toronto searching specifically for courses similar to those I had taken in Italy. Immediately, I became aware that the information I was absorbing was already in me but arranged differently. Concepts that flowed together inevitably in Italy, here stood independently, senselessly. It was as if the languages had been amazingly attracted and yet unable to touch and penetrate. As if aemulateo, Foucault’s second form of similitude, where recognition perpetuates space without contact, were struggling to become convenentia, adjacency of place, where fringes touch and mingle. Feeling their exclusiveness, I could commit myself fully to neither. Translation seemed a puny effort in such a struggle; something always seemed betrayed, and I avoided it. At first I lived the impossibility of translation as silence. In fact, I became aware of the exclusion of myself from one world and the other to such an extent that I started feeling irrelevant to both. The more attention I gave to the English world here, the less I understood the intense and committed life I had lived for eight years in Florence, and the more it haunted me. Then I started to write, in any language and despite all grammars. It would have been unintelligible to most, but as far as I was concerned, I was producing meaning, and on my own terms. And the view I got of myself from the page was that of two different sets of cards shuffled together, each deck playing its own game with its own rules. Perhaps because the page is white and gives the illusion of being outside the human body and therefore only mildly related to it through language, I realized that the act of speaking is also the act of being spoken. I saw myself shaping language, but I also saw how the page shaped me. Where a language claimed me, the speaker, it claimed not only what I uttered but also dictated the parameters of which I could possibly utter in given circumstance. At this point, I finally started to understand my relationship to language: it premeditated me and I, to the extent that I allowed it to carry me, determined it. The so-called betrayal of translation was really irrelevant; all form, including sound as language, betrayed for that matter. The point was to fully determine myself in a given circumstance: I could never change the given, but I could shape it as I engaged it. My fear of betrayal was, in fact, my fear of freedom to choose between forms. It had to be either one or the other at a given point in time; simultaneity was impossible. Like the old profile-vase perception exercise, English just could not assimilate my experience of Italian. It made external, stereotypical conjectures, but it could not incorporate the other sensibility as part of its own manifest reality. What was lived in Italian stayed in Italian, belonged to it completely. And vice versa. I found that I had no choice but to commit myself fully. Unless I offered my statement wholeheartedly to a language’s undertow of ironies, to its inner ‘ear,’ the meaning was not ‘felt’ and what was manifest in the statement lost sense and sensibility. Since I seemed to be possessed by the language I experienced, the experience had to reside not in me but in the ‘ear’ of the language itself. In theory, this sounds practical; in practice, as I materialized one ghost, the other would fade. I hated the seeming arbitrary blindness of the two languages. Each left me out while stumbling all over the other invisible entity that occupied the same territory–me. Finally, I thought that if the languages could only ‘see’ each other within me, I would stop feeling haunted and cheated. Writing, I tracked the sighting of one ghost or the other. The more I wrote, the more I found myself grammatically separating the languages. One poem would become two: one in either language. I would work on them until they seemed to snap apart and become independent entities; each becoming progressively more untranslatable as it progressed in its own direction. What surprised, and then delighted was that each poem came to a stop somewhere inside itself when it knew itself as coherent, whole and complete. At this point, each piece could recognize the other and know its conception from the moment it diverged. It could ‘see’ where the other broke off and how far it continued into itself toward its own satisfaction. Together, both constituted the whole bracket that was the extent of my experience of that poem. Nothing was left out; all the words were ghostless, full of me and present to themselves. It was then that I understood that translation incorporates the idea of the insufficiency of the object produced while being intimately involved in and committed to its production. Mine was a process of self-translation: I spanned the languages within my awareness simultaneously while each experienced the other in a ‘felt’ relation. I was generating a dialectical experience that was relative to both languages, and yet, at the same time, I was beyond them both. The event could therefore be remembered and explained. By translating myself into myself, by spinning a fine line in-between states of reality, I transcended the paralysis of being either inside or outside form. It was like transmuting lead to gold and back, solely for the pleasure of knitting their interrelation. I understood that the standardized language mattered only inasmuch as I could experience its translation in writing. Grammar was not written in stone, it was writing in me, and I was the only arbiter of the experience. Since I was both the author and the translator, who else could I consult? At this point I found I had something to say about the forms of these languages in a way that did not exclude my intimacy with them. My writing was a tool with which I held them so that they would produce me while I communicated within them. I could finally speak of English and Italian not as objects, but as subjects with individual personalities which acted upon me. English and Italian agree and disagree in interesting places. Anyone who has translated has certainly localized these common linguistic impassi. Take the English neuter ‘it,’ for instance, Hemingway’s ‘it’: a genderless, namely identity. It is raining; it goes without saying; how is it going? In Italian: piove; si capisce; come va? Where in English the vagueness of ‘it,’ although undetermined, must be acknowledged for the sentence to make grammatical sense, in Italian naming the ‘it’ is superfluous and tautological. Esso va bene is indeed redundant because the use of ‘it’ is determined by the degree of specificity which governs ‘its’ position in regard to the verb. For example, after deciding whether the ‘it’ is masculine or feminine (lo, la), Italian then considers whether the object is specific enough to be added to the verb, as is lo in the phrase devi vederlo, or emphatic enough to act as a subject: lo devi vedere. But at this point, if the subject is too universal, the lo disappears and is absorbed, as in the verb piove. In Italian, only conceivability and therefore specificity allows an object the possibility of independent grammatical action. One can imagine how this world-view limits the influence of the object upon the speaking subject. English, however, insists on containing the unmentionable in a form which functions to keep the ‘it’ separate from the verb. English has a hard time living with what is not comprehensible and vague and must keep pointing ‘it’ out whenever possible: a counter-spell to keep away the indeterminate spirit of ‘it is a nice day,’ or perhaps an attempt to expand ‘it’ into liveable, human space. But by doing this English grants independence to ‘it,’ an invisible subject, and that independence is tangible since we can say that the ‘it’ which is a nice is not necessarily just a nice day. But Italian also has its peculiarities. Those who have tried to translate English into Italian must have met up with the supreme frustration of not being able to do without the reflexive where one doesn’t want it. Let me clarify with a line from one of my poems: ‘and I imagine your hair holding the wind and curling.’ It is impossible to translate this line into Italian without the reflexive. E mi immagino I tuoi capelli che si arricciano per stringere il vento. To the English ear, me immagino, si arricciano imply intentionality of the I and of the hair. In English, there is no reason for the hair to be aware of itself holding or the I to imagine itself imagining. ‘It’ just happens. Succede. Perhaps Italian cannot grammatically contain the unnameable because it does not dare to take the phenomenological god in vain, preferring a grand variety of blasphemy instead. As for English, sexual reference in swearing accounts for most linguistic transgression. This is interesting in view of the fact that this very world-view has stripped the phenomenal world of gender. I hope and remember, but I want to live the present and write the present. I feel uneasy with language always going only part of the way. I want to speak myself. Yet in English, I say that the line of the poem I have translated is not acceptable: it violates the original voice. In Italian, I insist that if what I say is to be meaningful, action cannot be contemplated unless an actor intends it. And that’s that. It might be fruitful to explain the person I become in these languages in terms of what I can imagine within them. For example, in Furlan, the thought that beyond highway 11 in Ontario there are no other roads going north, only a vast expanse of forest wilderness, makes me panic. I cannot enter into relation with this threatening emptiness unless I think of hewing out a plot of land, building solid shelter and planting a garden for food. I would worry about how to get seeds and nails. Perhaps when things become stable I would tame a wild creature, a bear comes to mind. If I approach the same territory in English, I do not worry about food and shelter, somehow they are granted to me and do not cause anxiety. I would perhaps learn to fly so I could enter into some kind of relation with the immensity before me. It would not occur to me to tame animals, I would rather observe them in their natural state and learn small things about myself through watching them. My goal is not to recover specific memories of my remote childhood, although they tend to materialize unexpectedly, nor is it the manipulation of the formal possibilities of Furlan–this happens incidentally. Rather, my goal is to provide a bridge in which English can happen in the light of Furlan and, when possible, vice versa. There are areas within each of us that have never met, that don’t speak or listen to each other. If these areas are enclosed in languages, those of us who still have an active mother tongue have an interesting and definite area to cultivate, one that we can experience and reshape through translation. Because writing holds words in time, it is possible to return and ‘tame’ their meaning. It is possible to form and repeat those parts of ourselves which are repeatable in order to begin to recognize the sound of the self forming as different world views meet to negotiate experience. I find that when a poem or a story has passed through the sieve, gone from English to Furlan and back, from Furlan to Italian or Italian to English and back, each language still speaks me differently, because it must, but each speaks me more fully. 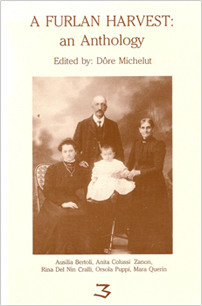 Dôre Michelut is the Friulan name for Dorina Michelutti who was born in Italy, grew up in Ontario and in 1972 returned to Italy to study. Dôre has also lived for many years in Southern Alberta and says the mountains remind her of Friuli. Her books include Loyalty to the Hunt (1986), Ouroboros: The Book That Ate Me (1990), Linked Alive (1990), a series of renga poems with Anne-Marie Alonzo and friends, and A Furlan Harvest (1993) which she edited. Her essay, "Coming to Terms with the Mother Tongue," appeared in Tessera, 6 (1989). The following prose poems which use words from the Friulan language are from Loyalty to the Hunt.